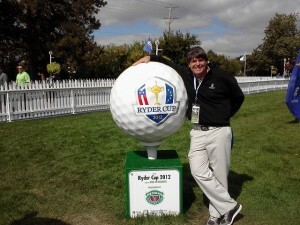 At Medinah having a ball with the 2012 Ryder Cup ball! 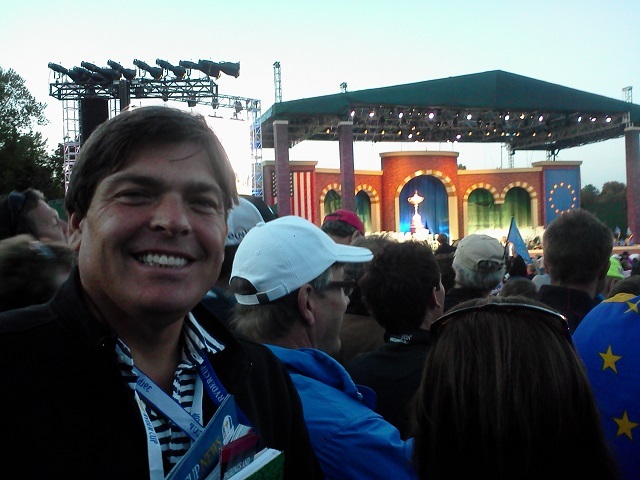 Golf Writer Andy Reistetter attended the 2012 Ryder Cup at Medinah CC with Premier Golf, the licensed travel agent for the PGA of America. 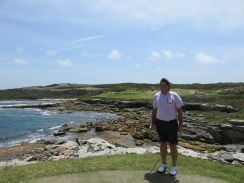 Is it possible to simply go on a golf vacation, experience it thoroughly, and leave the details to another? Join Andy and find out at the most classic of all golf destinations- the Ryder Cup. They say life is a journey and not a destination. They also say the Ryder Cup is golf’s premier event. They are right but with one caveat. If the Ryder Cup is your destination then journey there with Premier Golf, the licensed travel agent of the PGA of America. 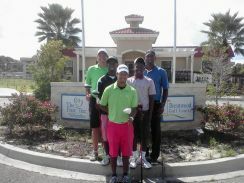 You will undoubtedly come away with knowing you have experienced a golfing competition like no one else can. 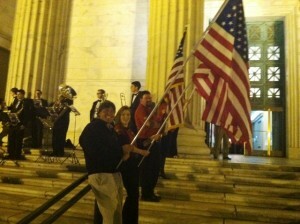 Helping out the Color Guard heading into the Blues & Bagpipes event at the iconic Field Museum in downtown Chicago courtesy of Premier Golf. They know how to make a package! Attending a Ryder Cup with Premier Golf is more than a golf experience; it is an intimacy of a lifetime. My brother once said “golf is a lot like life, the more you learn and understand about it the easier it is to meet its challenge.” Golf at a Ryder Cup is more than golf. It takes us to a place we don’t go to often enough in life. Or after the golfing is done you feel deep within that you witnessed a “Miracle at Medinah.” You breathe the rhythmic hymn of “Ole…, Ole…, Ole…,” an old Spanish blessing sung when people seem to rise above themselves in performance. And you find yourself singing “there is only one Ballesteros” right along with the victors. There is no doubt Seve helped win this one for the European Team. There is no doubt that Premier Golf is an enabler of all that is good with being at a Ryder Cup. Licensed by the PGA of America, the organization that represents the Golf Professionals at your club or public course and, they are the ones that conduct the Ryder Cup. What better ticket can there be than one from the people who create the event? Though it may sound like an advertisement, this is not an advertisement. In some degree it is a creative investigation into what just happened in this the 39th Ryder Cup in history. More importantly how did it impact me and how could it possibly impact the world beyond the sport of golf? 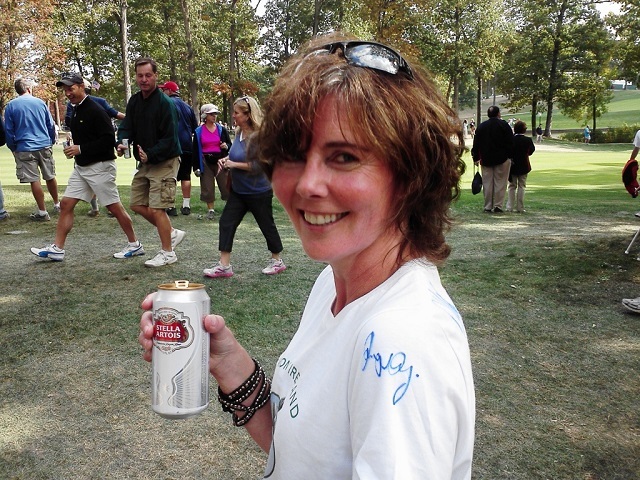 Here’s Carina with Rory’s signature on her shoulder and a Stella in hand… needless to say it is easy to fraternize with the opposing fans! To experience what I did on the grounds of Medinah CC these last four days first I had to be there. Yes I may have had a better view in front of the television or on my computer but I don’t think I could have had a better experience. There is something restorative about chanting with thousands of other people instantaneously at the unexpected holing of a putt. The thing with Premier Golf is the hotels and shuttle to and from the golf course. They are both “dedicated” but in a different sense. The shuttles are ‘dedicated” to customers of Premier Golf. They are waiting there for you when you want to leave the hotel and they are waiting there for you when you want to leave the golf course. If you want to be in the stands on the first tee to witness all 12 singles pairings tee off on Sunday starting at 11 a.m. there is a 6 a.m. shuttle waiting to take you, not me, there. I took the 10 a.m. one and was happy standing six-foot-three and three heads back on the rope line. 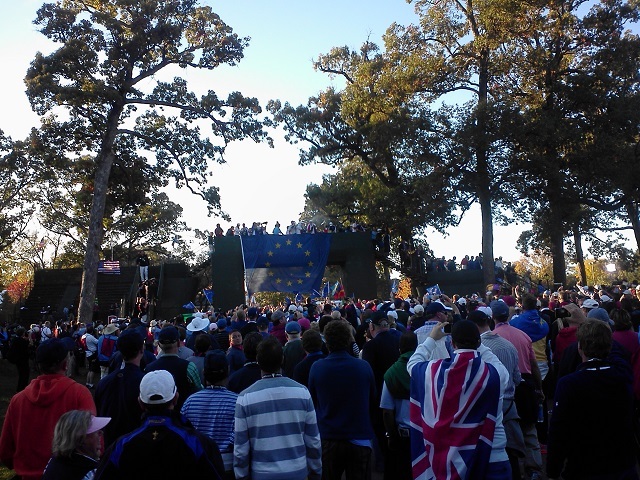 Euros celebrating their Ryder Cup victory at Medinah in 2012, their 5th win in the last six. Who will win at Gleneagles in 2014? I lingered after Tiger Woods and Francesco Molinari finalized the score of Europe 14-1/2 to U.S.A. 13-1/2. I witnessed the elation on the 18th green, the champagne celebration on the bridge and the Closing Ceremony. 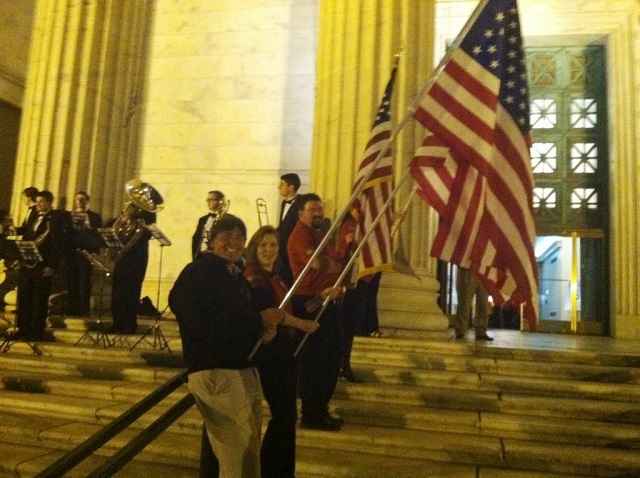 I saw the full moon rise as the flags of the Ryder Cup were lowered for another two years. Afterwards my shuttle bus was waiting for me. The hotels are “dedicated” to the customers of Premier Golf. A representative, usually one of their corporate staff, is there in the lobby at a Premier Golf hospitality desk acting as your personal concierge. If a question about logistics or the Ryder Cup comes to mind they have the answer. What is really good is that even if the question doesn’t come to your mind but should have they will communicate and share information with you to customize and optimize your experience. So my destination was the Ryder Cup and my journey was with Premier Golf. The folks I mingled with in the galleries at Medinah were the same as the folks on the shuttle- the five Englishman celebrating a mate’s 50th birthday and the father and son from Iowa celebrating together being a father and son. Premier Golf caters to people from all over the world. 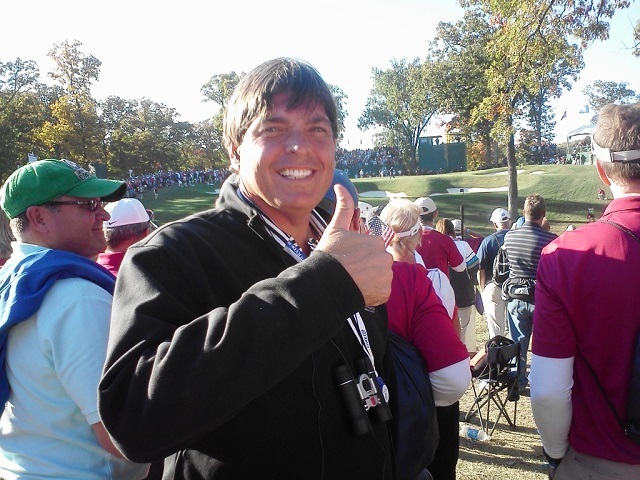 Thumbs up to golf and life and Premier Golf Ryder Cup packages! I found myself celebrating life at this Ryder Cup. Seve Ballesteros, a man who went all too soon at the age of 54, lived on in spirit all week at Medinah. A team of 12 golfers, their caddies and wives and partners, 4 vice-captains and one very special Captain, so inspired by Seve, came back from a deficit of 6-10 and won the Ryder Cup by the slimmest of margins. Sure this was sport but isn’t all life sport to some degree? Aren’t we trying to play it safe, hitting fairways and greens, in our life? Aren’t we challenged when things don’t go perfectly as planned? Too often don’t we find ourselves in a bunker, the rough or having to take a penalty stroke in life? Aren’t we trying to enjoy the journey and delay the final 18th hole destiny that we all share? One thing I realized this week is the diversity, specifically the intermingled diversity of the Ryder Cup whether inside or outside the ropes. Luke Donald went to Northwestern, is a member of Medinah CC and married an American woman. Is he European or American? My friend Wayne Richardson, a CBS broadcast assistant like me, caddied for Sergio Garcia in the playoffs and Ryder Cup. Is he American or European? What am I? You have to have a Closing Cereemony at Medinah to have an Opening Ceremony at Gleneagles. Will you be there? I hope to be. GO USA!!! My guess is that the answer is “yes” to all the questions of life. We are all citizens of this world. Generations from now it will be like Americans today, proud to be from one state or another, one college or another, yet more proud to be Americans than anything else. The Ryder Cup brings out the best in golfers and the best in us- the realization is that we are all the same- citizens of this world. It does matter who won the Ryder Cup at Medinah. But what matters more is the manner in which this Ryder Cup was contested and how it can inspire us. Life is too short. Already thinking about the 2014 Ryder Cup? Is it time to make the golfing pilgrimage to Scotland, the Home of Golf or to some other destination? Book your trip now with Premier Golf, the licensed travel agent of the PGA of America since 1988. 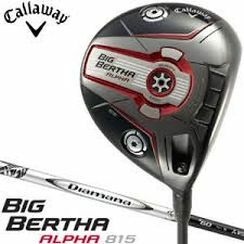 Click here to go to the Premier Golf Website. 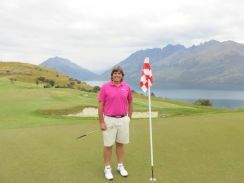 Andy Reistetter is a “golf voyageur and documentarian”, as well as a freelance golf writer, and Broadcast Assistant for The Golf Channel, NBC and CBS Sports. A lifetime golfer, Andy enjoys volunteering at the World Golf Hall of Fame and THE PLAYERS while pursuing his passion for the game of golf, along with everything and everyone associated with it.